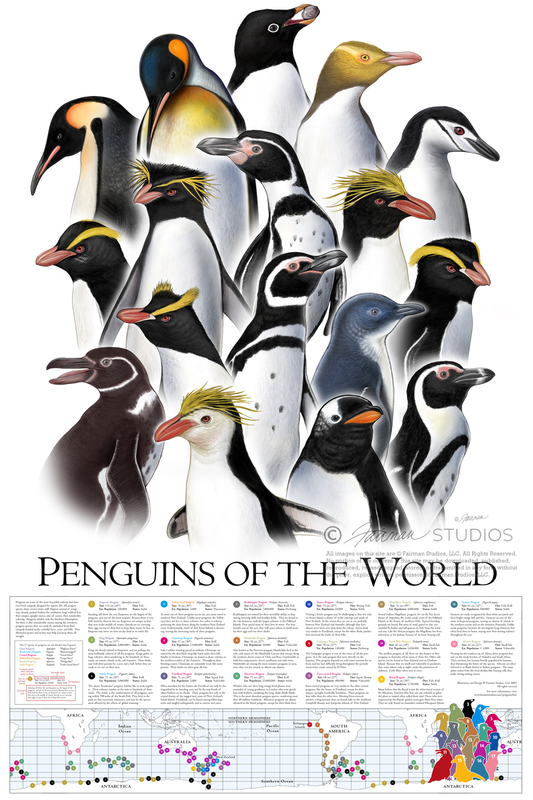 This is a uniquely definitive educational poster about all Penguins Of The World (dimensions: 24″ x 36″). Single posters retail for $24 including shipping and handling. Personalized autographed copies are $40 including shipping and handling. Wholesale quantities are also available. It was December 2001 that a phone call was received from the Saint Louis Zoo. An interpretive exhibits coordinator in the zoo’s education department, called regarding a new exhibit the zoo was in the midst of ground-breaking called “Penguin and Puffin Coast.” The zoo had already hired an architect and an outdoor exhibit designer to begin building a new facility which would house several species of penguins and puffins. Included in the design were to be one outdoor and two large indoor naturalistic habitats for the birds. In addition, the design group planned to build an interactive hands-on display with multiple panels which would teach visitors about the birds as they walked through the exhibit. Now all they needed was an illustrator to create habitus drawings of all 17 species. It’s been years since the exhibit opened in Spring of 2003. Since then these illustrations have been used to teach visitors form all over the world about the biodiversity of penguins of both warm and cool climates. Fairman Studios was chosen among a number of other illustration studios to create original illustrations that are now be part of an interactive walk-through display for the Saint Louis Zoo Penguin and Puffin Coast Exhibit.